Property 2: Sea Glass Hideaway, Designer Studio, Dog Friendly, Private Patio and Parking! Starting @99! Beautiful and Affordable Studio One Block From Wind and Sea Beach! Property 3: Starting @99! Beautiful and Affordable Studio One Block From Wind and Sea Beach! Property 4: Charming I BR Apt Pacific Beach, Attached to Ocean Front Home. Modern Luxury Tiny House- Near Beaches and Bay! FREE Mid Stay Cleaning! Property 16: Modern Luxury Tiny House- Near Beaches and Bay! FREE Mid Stay Cleaning! Property 18: Pet Friendly Bayside Studio with Kingsize Bed, Kitchenette and Beach Cruisers! Property 19: Apt in the Heart of Pacific Beach - 1 Mi to Coast! Property 21: Diamond Condo(C) - 2bed/2 bath w/AC & Parking! Steps to Beach! Wavecrest Cottage! Property 27: Steps to Beach! Wavecrest Cottage! Modern Studio Near Tourmaline Beach! Clean and comfortable, remodeled in 2012. Property 30: Modern Studio Near Tourmaline Beach! Clean and comfortable, remodeled in 2012. Property 32: Breathtaking Ocean Front Pacific Beach Apt. From 95p/n! Beautiful 1 Bedroom Apt. Sleeps 4, One Block From Wind & Sea Beach! Property 38: From 95p/n! Beautiful 1 Bedroom Apt. Sleeps 4, One Block From Wind & Sea Beach! Property 39: Blue Topaz: Apartment with A/C in the Heart of the Village, Walk to Shops & Restaurants. Property 40: Chic Beach Apartment..Steps to the sand...brand new...like a boutique hotel! Extra-Large Studio in Peaceful North Pacific Beach with Yard and Close to Beach! 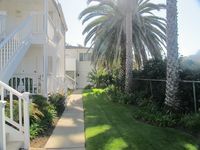 Property 41: Extra-Large Studio in Peaceful North Pacific Beach with Yard and Close to Beach! Charming 1 Bedroom. 2 Blocks to the beach..
Property 48: Charming 1 Bedroom. 2 Blocks to the beach..
Property 50: From 95p/n! One Bedroom Apartment, Sleeps 4 , 1 Block from Beach! The suite was clean, bright, and well equipped. We could walk anywhere within La Jolla and to the beaches easily. Michael was away, so unfortunately we didn't get to meet him. Lisa was a terrific host, very pleasant and helpful regarding La Jolla and area. The hosts were there when we needed them, but gave us all the space and privacy that we needed. Communication was great before, during, and after our stay. Bottom line - was an outstanding stay, and we'll definitely be back to enjoy the hospitality and the La Jolla area again! Very clean place. Well stocked with dishes and cookware. A block off of the beach, walking distance to all of the businesses in Pacific Beach.